1. 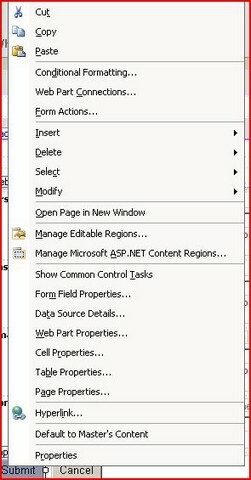 Create a Custom List in SharePoint, and specify the columns you want (these will be the fields on the feedback form). 3. Create an empty page for the Thank you page to go on. 4. Fire up SharePoint Designer, and open your Feedback form. 5. Add your Feedback list to the form. 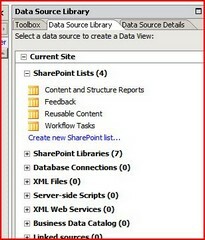 This is done by opening the data source library, and the SharePoint lists section. 6. Choose the List you created earlier, and click Show Data. 8. 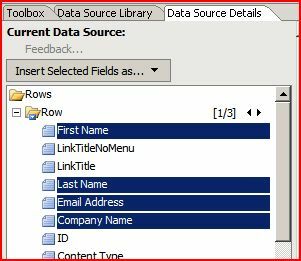 Click on the ‘Insert Selected Fields as…’ box and choose ‘New Item Form’. Your fields will then be added to the page, along with a Save and Cancel box. 9. If you then right click on the Save button (I’d be inclined to rename it to Submit, but thats up to you), you can choose Form Actions. 10. You can then set the actions that take place when you click the Submit button. If you add a Navigate to Page action, you can specify where to take the user when they’ve entered their information. 11. There you go. All done. 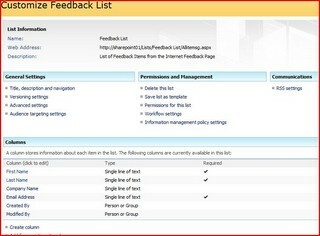 You have your Feedback page, where visitors can enter information, and a list. Once the visitor has entered the information, it will appear on the list you created. How straight forward is that ? and no coding whatsoever.